Blue River - Blog from Blue River, British Columbia | Dreaming of a White Christmas! The bear adventure continues! Today we saw black bears!!!!! We left Jasper and headed for Blue River. It was raining and not long after leaving Jasper we crossed into British Columbia where we gained an hour. We went up and down mountains and past lakes and creeks. Many of them had signs up saying they were salmon habitats. The mountain scenery was beautiful. There were a lot more autumn colours - lots of yellow from the trembling aspens and the occasional red mixed in with the green fir trees. We came to a town called Valemount which seemed to be quite a big town. There were lots of signs up for heli skiing and canoeing trips so it must be a town where people come for outdoor adventures. There was a sign for a Swiss bakery so we stopped there for lunch. I had a salmon sausage roll. Yum!!!! Blue River was only half an hour or so further on. We checked into the hotel and went to the River Safari which we had read about before we came on this holiday. We decided to do both the River Safari and the Jeep Safari. We did the jeep first. There were 4 of us in the jeep with our driver Debbie. We climbed up and up the mountain on a narrow dirt road. Debbie took us to where the last tour had seen bears. We drove down an even narrower track which was a bit scary. I could reach out and touch the bushes knowing the bears could be just there. Because it was raining, the jeep had a roof but the sides were open. I was in the back next to the open side and Robyn was in the front. Debbie drove to a clearing at the end and told us all to look around and tap her shoulder if we saw a bear. After a few minutes I looked behind us and saw a black bear walking down the road behind us. By the time I has tapped Debbie and looked back it had gone. A few seconds later the bear eyeballed me from about 10-12m away on a small rise.It was scary fir a second as I realised I was pretty exposed with no sides on the jeep. But, the bear turned and walked along the rise. It was very cool to see it so close. The bear moved around the area munching berries from the bushes and digging around. We only moved on when the bear disappeared from view. We continued up the mountain stopping to look at the view and always looking out for bears. We reached a height on 1420m before coming back down. On the way back down, Debbie asked us if we wanted to go back to where we saw the bear on the way up. Of course we all said yes. As we headed down the narrow track, we saw a bear right there on the track. Debbie stopped and we watched and held our collective breath as the bear walked towards us. It was on Robyn's side. Debbie told Rob the bear was going to walk past her but he pulled off into the bush about 8-10m in front of the jeep. Debbie told us later she would have moved forward if the bear had continued to come towards us. The jeep was bigger than the bear and to reverse would have shown us as retreating. We continued back down to the clearing and it wasn't' long before the bear appeared in the bushes near us, he was looking for food. After 5mins or so, another bear appeared off the side of the jeep. It was also foraging for food. The first bear approached the second bear and stood up trying to intimidate it. We heard them making growling noises and they went for each other. We thought we were going to see a bear fight! But, they moved apart quite quickly. We were out in the jeep for about 2hrs and it was just fantastic. When we got back to the dock we had to wait a bit before our river safari. There had been a couple of jet boat drivers call in sick so we had to wait until a bus group arrived. It was still raining as we were put into a life vest, had a poncho put over our heads and climbed into the boat. The drivers had word there was a bear out so we went out quickly to a little island in the river where a black bear was eating berries right at the shore line. The boat driver moved the boat around a bit so everyone got a good look at the bear. After a while we moved on. The boat moved quickly through the water and the rain felt like needles hitting my face. It would have been absolutely stunning on a nice day. It is a rainforest area and the mountains are rock and covered in pine trees. They come right down to the water line. There were very few 'beach' areas. Blue River is fed by a couple of glaciers giving it the blue/green appearance similar to Lake Louise. We stopped at a little jetty where we all climbed out and walked up a track to a beautiful waterfall. It was hard to move with all our own layers, a life jacket and a poncho! On the way back to the dock we came across another bear on the shoreline. 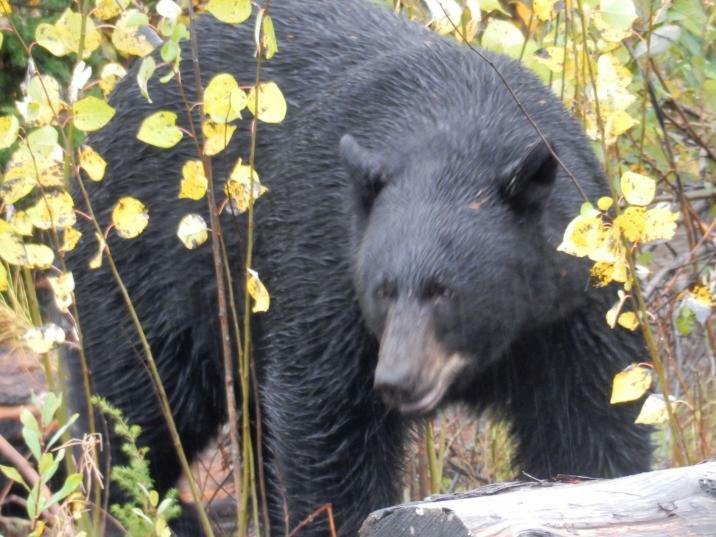 The black bears are considerably smaller than the grizzlies we saw in Alaska. Thus is mainly because of their diet. Although there is salmon in the river, the black bears are not good hunters so they rely on berries and small insects for food. It was a fabulous adventure!